Unfortunately not, but it will be a week or 2 before we see the full extent of the damage. 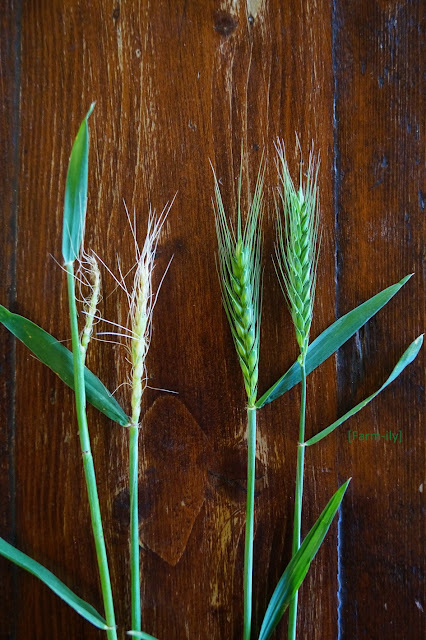 The wheat on the far left is immature and hasn't emerged from the stem which is like much of the paddock... we split the stem open to see the heads. Once all those heads emerge (like the other 3 stems) it will be quite obvious as to how much of a problem we have. Ouch. I am so very sorry. Every picture tells a story. In this case, possible blighted expectations. Oh dear, the difference is stark. Weather has a way of catching us. Worrying times - frost and drought. I hope all comes good quickly! Before your blog educated me I'd never have associated the area with frost. We are so dependent on the whims of Mother Nature, aren't we? It's often said here that wheat has nine lives. I'll hope that for you, too.